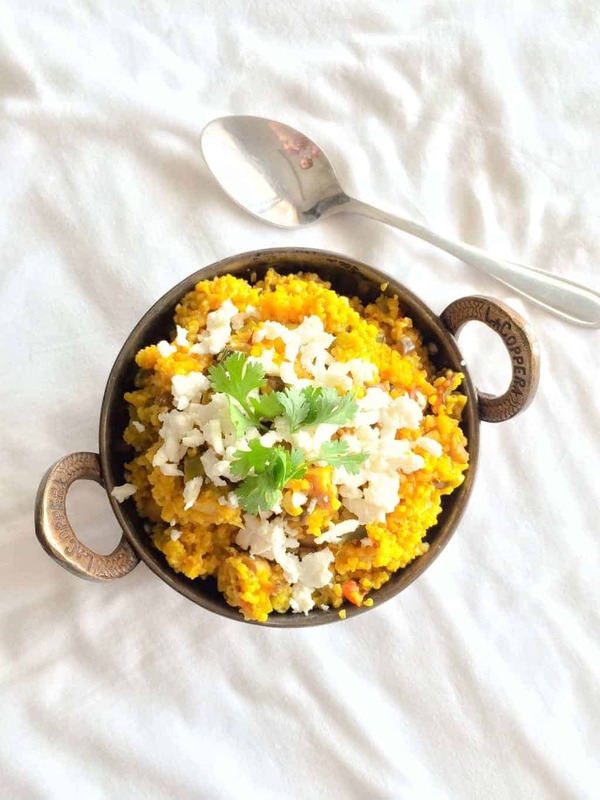 Vegetarian Bulgur Porridge or Daliya is a healthy, simple and vegan breakfast recipe which is full of fiber and veggies. This is a recipe that will leave you feeling full, and will keep you energised throughout the day. It contains simple ingredients, is full of flavour, and is made in the pressure cooker. Bulgur porridge or Daliya, as many people know it, has a lot of nutritional properties and is a whole wheat product which results in positive effects on our metabolism rate. Besides the fact that it is very healthy and delicious, I have a personal attachment to this dish. This is a family story about my parents and of course about food. My dad loves food and loves it like he loves all of us, passionately. But he’s a picky eater and only wants the “good” food. You know what I mean? He loves chicken makhani and the aloo tikki and the Sunday pakodas but he hates regular food. The stuff that regular people like you and I eat as a part of our routine and the kinds that may come across as “boring” to many people like my dad. So every once in a while, when he’d have a business dinner to go to alone, which was only once in a while since he also loves to drag us everywhere, my mum, sister and I would make complete use of the opportunity and cook some comfort food which is light and yet so full of flavour. Food that we wouldn’t be making when dad was around and this dish is one of them. It’s not very popular, and is usually cooked when someone’s not well because its easy to digest but its one of my favorites because I have so many memories attached to it. And that’s what makes food so special, doesn’t it? The memories that we build while we eat with family and loved ones. Just one bite of the dish invokes a sense of nostalgia and transports us back into time. What are some of your favorite food memories? Comforting vegetarian daliya or savory bulgur wheat porridge which is vegan and is a healthy breakfast option. In a pressure cooker, heat olive oil, and add green chillies, onions and ginger garlic paste to it. Saute for a few minutes till onions are pinkish in color and add tomatoes. Once the tomatoes are partially cooked and start breaking down, add the rest of the vegetables and spices. Cook for 2-3 minutes and add the daliya. Dry roast this mixture for 2-3 minutes, add water and salt and put the lid and weight on the pressure cooker. Let this cook for 15 minutes. The pressure cooker should give out 3-4 whistles. Let the steam out naturally from the cooker and serve hot. Tastes best with curd. 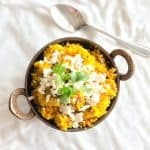 I love adding some grated cottage cheese to the daliya once cooked. It adds a wonderful creaminess to the dish. Go bonkers with the vegetables. I’ve used anything and everything with this and it always tastes awesome. This goes really well with other cooked vegetables as well and tastes almost like rice. It’s a great vegan one pot dish. I hope you try it and like it Madhulika. It’s one of our favourites at home! Thanks for this recipe, its I used to try only with the nuggets and this will give me a different spin. Although the sound of Daliya makes most people wince, but I would eat it for a good hearty masaledar meal. I tried this one, and it isn’t one of those bland, close your eyes and gulp sort of a recipe. Its absolutely mouth watering delicious!